Film night is always among the most popular and best attended Tanglewood programs. 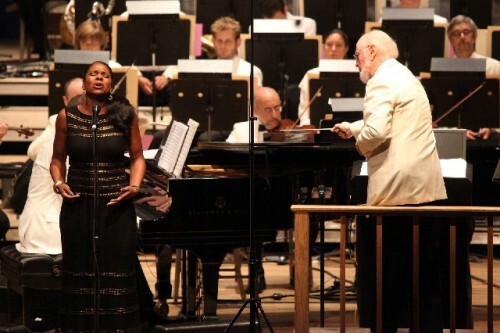 Audra McDonald with John Williams. Hilary Scott BSO photos. Williams accompanies McDonald in an encore of As Time Goes By from Casablanca. 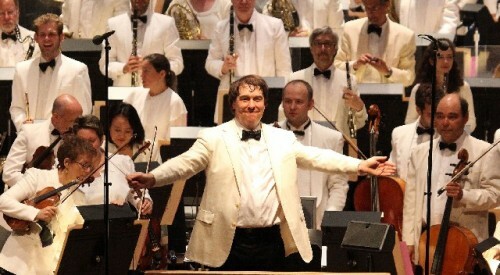 Conducting to an excerpt from Raiders of the Lost Ark. On a gorgeous summer night, as the season winds down, the Shed was packed and on the lawn at Tanglewood blankets were densely spread as far as the eye could see. 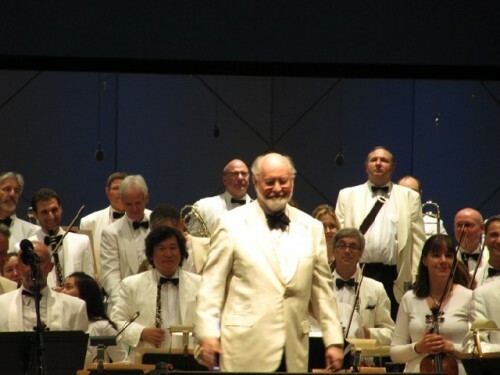 It was a tribute to the annual John Williams Film Night conceived and conducted by the greatest living composer of some 100 films. He has received five Oscars and forty-eight nominations. Including the 2012 score of the nominated Lincoln one of numerous collaborations with Steven Spielberg. He has also composed the scores for all six Star Wars films by George Lucas. He told us that there is another collaboration in the works. That evoked cheers from the audience. Last night at the end of the program he presented a tribute to his pals Lucas and Spielberg with a medley of Jaws, Star Wars, Raiders of the Lost Ark and E.T. accompanied by clips in a montage from those films. Now 81 he speculated on how long he will continue to work on film scores. Last year many of his famous friends popped up on stage for the gala 80th birthday celebration. Perhaps many came last night in anticipation of surprise appearances by famous directors or friends from James Taylor to Yo Yo Ma. It proved not to be that kind of program. Overall, Williams seemed to put less creative energy into the appearance than we have come to expect. Often his Film Nights have been in depth history lessons about aspects of the craft. Like the time that he showed us raw footage of a train sequence in a Raiders film and then ran it again with his score. We gained valuable insights to the creative process. 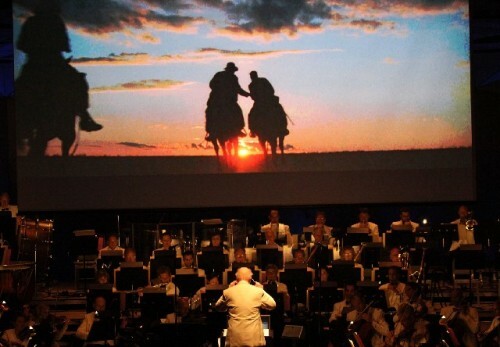 Who will soon forget magnificent studio tributes like an evening devoted to Warner Brothers? Or an evening dedicated to Spielberg in which the director made an appearance. There were signs of transition and change. The evening opened with Williams conducting the familiar “Horray for Hollywood.” It is noteworthy that this summer Keith Lockhart also included it in a Pops night with Michael Feinstein. It is always captivating when Williams puts down the baton and regales us with anecdotes. Introducing three selections by Alfred Newman, followed by three by Henry Mancini, he recounted his early years in Hollywood. He recalled as a rookie being taken under the wing of the renowned Alfred Newman. This included visits for dinner at his home. There Williams first encountered David Newman who grew up to be a violinist, conductor, and historian of music for films. Williams then turned over the baton for the remainder of the first half of the program. While thoroughly enjoyable it was, well, not what we came for. It may, however, have been an extended audition and preview for when the baton is passed. Surely Film Night is such a Tanglewood franchise that it will continue in new iterations after the eventual departure of Williams. Only the composer/ conductor can say when that will be. But one got a sense of how the formula works. Newman conducted his father’s works from Captain from Castile, Wuthering Heights (violin solo by Elita Kang) and How the West Was Won. For Mancini he started with Victor/ Victoria then some hilarious scenes from The Pink Panther. Newman told us how the studio chief nixed “Moon River” from Breakfast at Tiffany’s in the final scene. He related how the normally impeccably refined Audrey Hepburn responded with a rather unladylike expletive. The song remained as we experienced in a clip from the rain drenched and heart breaking scene. Newman’s segment ended with clips from Casablanca and the exotic, North African flavored score of Max Steiner. Following intermission Williams returned with guest artist Audra McDonald. She sang six relatively less known songs “Lose that Long Face” “It Might As Well by Spring” “Hurry It’s Lovely Up Here” “The Man That Got Away” “Too Late Now” and “10, 432 Sheep.” I never heard of that one from The West Point Story which may one day pop up on Turner Classic Movies. While a magnificent singer her vocal range and style is more suited to Broadway and opera than to jazz and blues. Often while admiring the beauty of her voice I tend to miss the guts and feeling of the greatest singers. It is always a treat to hear Williams but this was hardly her most memorable appearance at Tanglewood. For that we recall a stunning evening a couple of years ago at Ozawa Hall. She was coaxed back for an encore. Acknowledging the audience she announced that she would do one more only on one condition. That Williams himself accompany her on piano. That resulted in the absolute highlight of the evening as she put her heart and soul into a torchy rendering of “As Time Goes By” from Casablanca. We could have used more of that. Williams concluded with Indiana Jones, which is always fun, and then the Lukas/ Spielberg tribute. Clearly, the program thrilled and totally captivated a capacity audience at Tanglewood.